Manabi Straight! 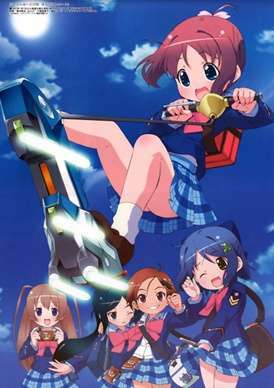 follows the lives of a group of young high school girls living in the year 2035 while they attend the all-girl Seioh Private High School. Since the birth rate has dropped dramatically, schools are being closed down due to the sheer lack of students available to teach. Morale in schools has dropped dramatically, and Seioh is no exception. The story begins when the main character, Manami Amamiya, transfers to Seioh. After some initial hijinks involving a futuristic scooter and a swim meet, followed by an inspirational school song performance, she is inducted as the student council president. The story that follows pertains to Manami working with Mika Inamori, the only other student council member, and three other classmates named Mutsuki Uehara, Mei Etoh, and Momoha Odori, in student council matters. After some remodeling of the student council room, Manami and her friends set forth to plan for the upcoming student festival.